The last four weeks have seen thousands of tributes to rocker David Bowie. 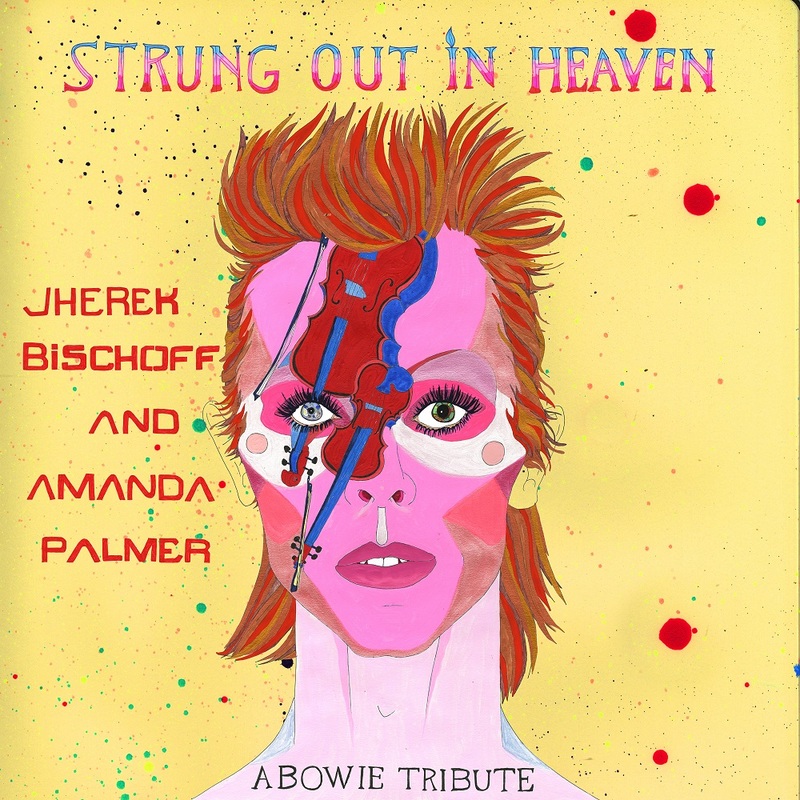 Strung Out In Heaven: A Bowie String Quartet Tribute by Amanda Palmer and her Theatre is Evil collaborator, pop polymath Jherek Bischoff, is both gorgeous and ambitious. It came together quickly. Bischoff arranged the album’s five tracks and spent three and a half hours recording the strings (Serena McKinney and Alyssa Park​ on violin, Ben Ullery​ on viola, and Jacob Braun on cello). Meanwhile new mother Palmer lined up three days worth of babysitting in order to dive back into the studio. She also tapped some famous friends, who contributed in smaller ways. The recording, coordination, guest appearances... and babysitting were financed by a stockpile from Palmer’s 7000-some supporters on the crowdfunding site Patreon. It doesn’t sound like a whip out. Each tune is matched to a Bowie-centric image by a visual artist. On Palmer's Patreon blog,"Blackstar" artist, elementary school teacher, and cancer survivor Cassandra Long writes about discussing Bowie's death with a roomful of kindergarteners. Palmer plans to provide a similar platform to the other participating artists in the days to come. The finished product is both professional and a labor of love. Music is the binding agent of our mundane lives. It cements the moments in which we wash the dishes, type the resumes, go to the funerals, have the babies. The stronger the agent, the tougher the memory, and Bowie was NASA-grade epoxy to a sprawling span of freaked-out kids over three generations. He bonded us to our weird selves…Bowie worked on music up to the end to give us a parting gift. So this is how we, as musicians, mourn: keeping Bowie constantly in our ears and brains. The complete tracklist is below. You can listen for free, but an ante-up will help Palmer cover 9¢ in licensing fees every time one of the songs is streamed. Any leftover proceeds from sales through March 5th will be donated to Tufts Medical Center’s cancer research wing in memory of David Bowie.